A grain of salt and a healthy dose of skepticism. These are the two most important tools you will gain after reading this Quick Cash System SCAM software review and BLACKLIST notification. It seems the infamous Sarah Markel is making a comeback on Facebook Sponsored Ads where the people behind this vile scheme find it easier to target innocent new victims who are clueless about binary options scams and deceptions. Apparently they have renamed it as the “Quick Method System”, but kept the original logo and everything else. As we have mentioned in our previous reviews, we find it reprehensible and unacceptable to use children in order to promote a nasty online investment SCAM, and we plan to file an official complaint with Facebook as they have not acted in good faith and left their integrity at the door while looking only at the profit margins. What’s even worst, Facebook has completely disregarded it’s own advertising policies and guidelines which makes them hypocrites at best, and in this writer’s opinion accomplices to commit an online investment scam. The image above represents a screenshot taken from a Facebook ad on one of our member’s timeline. As you can clearly see the video is the same and the exploitation of innocent children to promote a nasty fraud is clearly evident. You can even see how effective this presentation has been since it has 40 Million views, 20K shares, and 10K comments. This is a clear indication to us that advertisers are making a killing peddling this fake app since they are paying for this exposure and are not in the business of losing money. Now, to make matters even worst, above you will see a clipping of Facebook’s ads policies (feel free to check out the URL yourself). It clearly states they will not allow “deceptive, false, or misleading content, including deceptive claims, offers, or business practices.” Well, I think this malicious SCAM most certainly answers to that criteria and anyone with half a brain and a pair of eyes can see that. It saddens me to see how Facebook is complicit in this obvious crime, and has chosen to ignore the facts which are indisputable. The marketers want to promote products and make commissions, but their problem is where to advertise and how to do it in the most profitable and cost-effective way. When people surf the internet on seemingly legit sites like Forbes, Reuters, USA Today, and Facebook they assume a certain level of integrity and professionalism has been met and this immediately corrodes their psychological defense mechanisms. This is what’s called fertile grounds or virgin traffic in the eyes of savvy online marketers, and they will exploit it as much as possible since they understand this advertising opportunity may be snatched at any point as people have a tendency to complain. I can’t overstate my disappointment with the social network and their so called “ethical” advertising practices. They are directly responsible for causing thousands of people grief and financial stress by providing an aura of legitimacy to scams like the Quick Cash System (or method). At the end of the day they are just as guilty as the affiliate trying to get commissions, or some scam broker trying to squeeze money out of some poor guy who has refinanced his home because some “senior broker” advised him to do so. Why is the Quick Cash System Such an Effective Scam? Well, the truth can be found in what’s missing. Our previous impartial reviews have clearly mentioned there is a serious lack of transparency as to where the winnings are derived from, and actual visual representation of the trading software. The testimonials are not from fiverr.com actors and have been very well selected and briefed on how to project an image of sincerity. The whole premise of this diabolical scheme is based on the notion that people will be willing to risk money even if inside they know it is a SCAM. They would rather risk losing money as opposed to lose the perceived opportunity to achieve wealth and prosperity in the near future. In reality, nothing could be further from the truth and the more our staff investigates the inner workings of this sham, the more we understand how intricate and deceptive it it. A lot of money has been invested in this high-end production, and people are impressed when they see a successful middle-aged single mother. Most people relate to this type of narrative and can view themselves as the person who is conveying the message. That is the secret behind the success of this fake app, and why it is one of the most dangerous and evil scams being promoted these days by online marketers. “Behind every successful man there is a successful woman”. That’s how the sales pitch really starts, and then this actress goes on to tell us a sob story about how she got divorced and had to make it on her own so she got her hands on this software and now she is totally debt-free and living the life she always dreamed of. The rest of the presentation highlights the usual sales points with emphasis on inflated bank accounts, fake testimonials, pressure counters pushing you to invest and take action NOW or risk losing this golden opportunity which will never come back. She called it “a healthy dose of regret on your chest”, but strangely enough this woman should be the most regretful woman in the world since she is an active participant in an investment scam that uses two naive children who are clueless about what they got involved with and will have this mark of shame added to their identity for the rest of their life. The Quick Cash System is a verified SCAM software, and we have posted a BLACKLIST notification in regards to this app and auto-trader in our previous reviews. Sarah Markel is a paid actress, who does a good job at portraying a successful single mother who has made it despite all the trials and tribulations she faced in life. 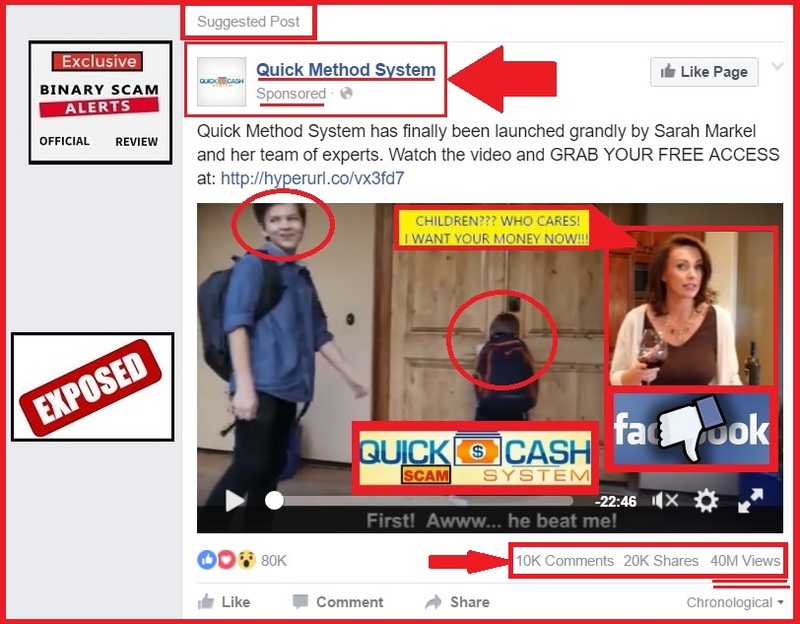 Unfortunately, she does such a good job that thousands of victims have fallen prey to this obvious scam, and we are outraged at the fact that Facebook is allowing these charlatans to place sponsored ads on their advertising platform. If you have been exposed to this type of false and misleading form of advertising we implore you to file a complaint and make sure to explain in detail why it should be removed. If you have already invested via this fake signals tool, try to cash out whatever is left of your balance and in any case NEVER re-invest because you will lose your money and that is a guaranteed and proven fact. Contact us via our Facebook Page and YouTube channel to get informed.